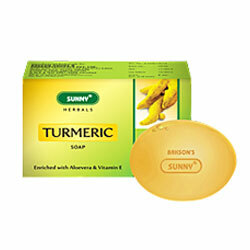 Bakson's Sunny Herbals Turmeric Soap Nourishes & Protects Skin, Improves Complexion, Promotes Healthy, Glowing Skin. Enriched with Aloevera and Vitamin E.
Turmeric with its antioxidant and antiseptic activities nourishes and protects skin, improves complexion promoting a healthy, glowing skin. Aloevera and glycerine with their added benefits make skin soft and supple.